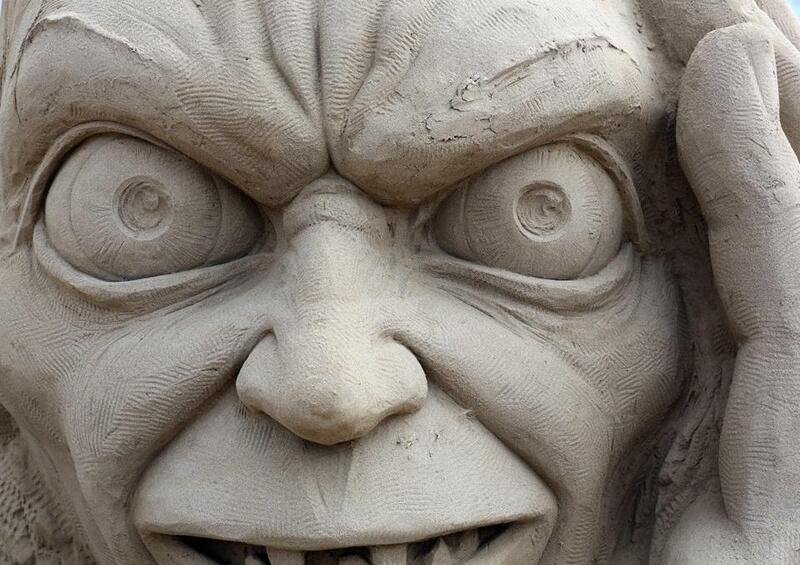 A sand sculpture of Gollum, a character from J.R.R. Tokien’s “Lord of the Rings,” was part of a sand sculpture festival in Weston-Super-Mare, England, in March 2013. You really know your political career is in trouble when people start comparing you to Gollum. Poor Theresa May was on the wrong end of some Tolkien-inspired satire last week, when the actor Andy Serkis released a spoof video with the title “LEAKED: Footage from Inside No. 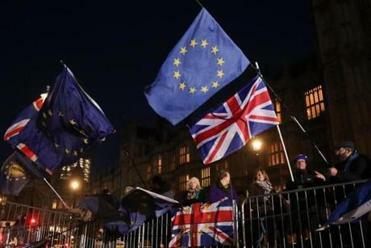 10 Downing Street!” Serkis, who played Gollum in Peter Jackson’s film adaptations of “The Lord of the Rings,” had the inspired idea of combining the characters of Britain’s prime minister and Tolkien’s cadaverous, covetous, conflicted villain. Just as in “The Hobbit,” the novel that first introduced Gollum to the world, Mayllum has a split personality. Part of her craves the draft European Union withdrawal agreement as obsessively as Gollum craves the magical golden ring. But part of her — the remnant of the person who two and half years ago half-heartedly campaigned to keep Britain in the EU — resists. Britiain is like a disabled pleasure steamer that is drifting toward an enormous waterfall. Serkis’s spoof struck a chord in our household not because we are die-hard Remainers (as all actors appear to be). Brexit has divided our family in unexpected ways. My wife is a committed Leaver; a majority of the children are, like most of their generation, Remainers. Having campaigned against Brexit and lost, I came to terms with the referendum result, but I confess to having my own Gollum-like moments of inner struggle, which is probably why the Serkis video didn’t make me laugh. The funny thing is that our family is equally divided over Tolkien. As a boy, I read and reread “The Hobbit” and “The Lord of the Rings” trilogy. My daughter is just as addicted to the films. My third son is a fellow hobbit. At the tender age of two, he responded with complete fascination when I first read him “The Hobbit.” Now six, he is immersed (along with his father) in the spellbinding audio version recorded in the 1990s by the Australian-born actor Rob Inglis. The scientists in the family remain baffled by our Tolkien mania. My mother and my sister — both physicists — have long regarded any book containing either elves or goblins as unfit for consumption by rational beings. They have been mocking me on this subject for close to a half-century. They and their ilk, however, are losing the argument. Leaving aside the great monotheistic scriptures, the Bible and the Koran, “The Lord of the Rings” is the most popular book in the history of publishing, having sold more than 150 million copies since its first publication in 1954. Its influence is ubiquitous, from Oxford, where J.R.R. Tolkien spent most of his life, to Silicon Valley, which is full of Tolkien enthusiasts. There is nevertheless a puzzle that has only just struck me. Why, if his books are so immensely popular, has Tolkien’s deep-rooted conservatism had such a tiny influence? For nearly all Tolkien’s millions of readers seem somehow to have missed the fact that the great edifice of his fiction stands on a foundation of profoundly Tory philosophy. A devout Roman Catholic who preferred the Mass in Latin and looked down on his friend C.S. Lewis’s Protestantism, a tweed-clad Oxford don who despised central heating and abhorred the advance of the automobile, a pipe-smoking reactionary who refused to touch French cuisine or visit the United States, Tolkien was a Little Englander to the point of self-parody. In prosperous old age, he crossed a cheque to the Inland Revenue with the words “Not a penny for Concorde.” Even the Norman Conquest struck him as a contamination of his country’s Anglo-Saxon essence. Though Tolkien himself dismissed all attempts to find contemporary meaning in “The Lord of the Rings” (“I dislike allegory wherever I smell it,” he once said), it is hardly accidental that his diminutive heroes inhabit an idyllic Shire, while “the enemy” is based in industrial-totalitarian Mordor located in the East of Middle Earth. Tolkien was first and foremost a linguist and philologist of exceptional ability. But the spirit that infused his work was so conservative that, if he were still alive today, he would be “no-platformed” on every campus in the land. The central story line of both “The Hobbit” and “The Lord of the Rings” is of a pilgrimage, full of trials, tribulations, and temptation, not to mention self-sacrifice. The books are only multiracial in the sense that there are hobbits, elves, and dwarves as well as men. Yes, men. In Middle Earth women are occasionally seen, rarely heard. We are left with a profound paradox. The most popular author of modern times filled our imaginations with unforgettable characters like Gollum — and yet failed completely to instill in us an iota of his Tory principles. The bitter irony that Remainers now use Gollum to mock Brexit would not have been lost on Tolkien. Never in the field of English literature was so much misunderstood by so many.